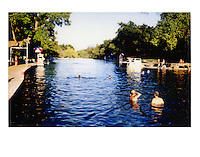 Barton Springs Pool is a man-made recreational swimming pool located on the grounds of Zilker Park in Austin, Texas. 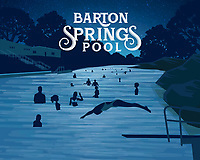 The pool exists in the channel of Barton Creek and is filled by water from Main Barton Spring, the fourth largest spring in Texas. The pool is a popular venue for year-round swimming, as its temperature maintains a narrow range from about 68.0 °F (20.0 °C) in the winter to about 71.6 °F (22.0 °C) in the summer. Beautiful girl relaxing in swimming pool.